The Oklahoma teacher walkout has ended after nine days, the state’s largest teachers union said, but teachers across the state pledged to continue fighting for more school funding and higher pay. The union decided to end the walkout Thursday after it became clear that Senate Republicans in the Legislature “won’t budge an inch on any more revenue for public education” after days of negotiations with lawmakers in both chambers, Priest said. That resulted, the Oklahoma Education Association said, with average raises of $6,100 for teachers and $1,250 for support staff. The union called those gains a “truly historic moment” but said they didn’t go far enough. It wanted the teachers’ raises to average $10,000. The legislation also raised other education funding — money for textbooks and the state-aid formula, and for flex health care benefits — over the next fiscal year by more than $70 million. The teachers’ union also wanted those numbers to be higher. During the walkout, there were legislative squabbles over how to pay for the spending increases— a recently passed hotel and motel tax was repealed, and lawmakers passed a gambling tax and a measure to make it easier for the state to collect sales tax from purchases on online outlets such as Amazon. But the total promised increase in spending for next school year remained roughly the same. The governor, who compared striking teachers to “a teenage kid that wants a better car” last week, said Thursday that she was glad they were returning to school. 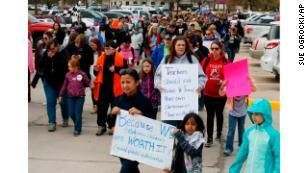 The decision to call off the Oklahoma walkout was met with mixed reaction from teachers, some of whom said the teachers’ union ended it prematurely. “I’m disappointed in the pullout of support from our teacher-led movement to secure more funding for our schools before a consensus was reached through a majority of polling efforts,” said Jessica Lightle, a teacher at Puterbaugh Middle School in McAlester. Efforts to obtain more funding will continue away from the Capitol, Priest said. 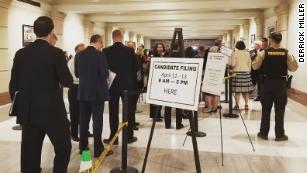 The union will be supporting its members and candidates who are running for office during the midterm elections against those who opposed funding Oklahoma’s schools. Fourth-grade math and science teacher Carri Hicks brought her students to protests at the Capitol in Oklahoma City. She called the decision to end the walkout “bittersweet.” But she said the experience galvanized her and others to run for office. Jonathan Moy, a teacher at Yukon High School near Oklahoma City, blamed legislators for their unwillingness to budge. But he said he’s ready to go back to school. Posted in Advocacy, Educators Protest, Funding For Education and tagged "Standing Strong for Public Education", #iBelieve, Accountability, Accountability System, Advocacy, Department of Education, Diversity, Education, Education Funding, English Language Learners, Equity, Every Student Succeeds Act (ESSA), Failing, Failing Schools, Federal Education Policy, HBCU, High-Needs Students, NEAExecutiveCommittee, Pension, Pensions, Public Education, School Choice, State Budget, Students, Tax, Testing and Accountability. Bookmark the permalink.